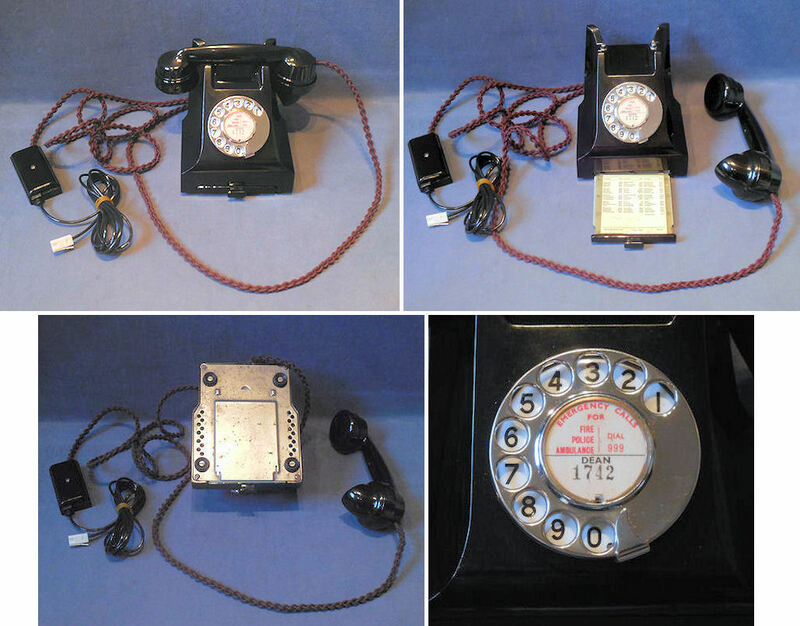 Original, quality Candlestick Telephone, with a bakelite mouthpiece and cover to the earphone. 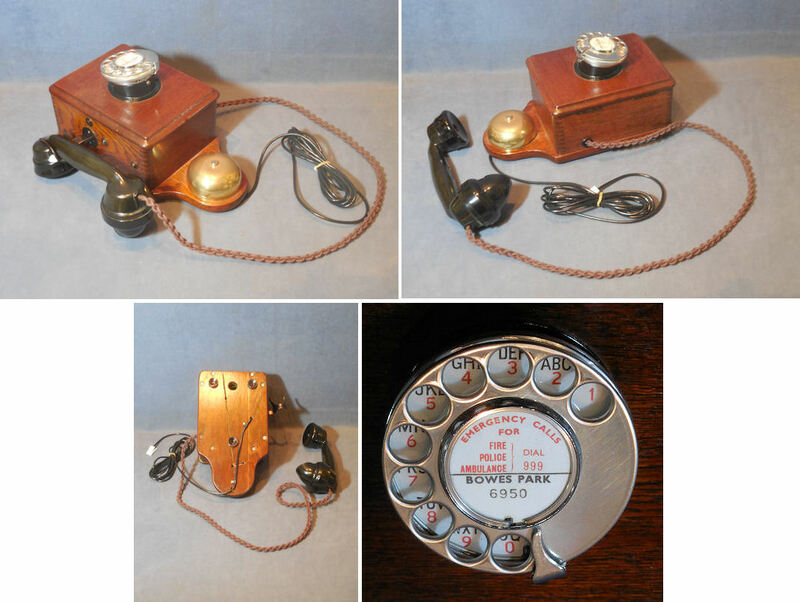 The dial version of the candlestick telephone was introduced in the early 1920's and phased out in the late 1930's. 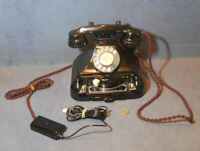 During the current restoration and conversion this telephone has been completely disassembled and cleaned, some parts and the cords have been renewed, and full details of the work carried out, with a list of replacement parts fitted is included with this item, as well as photos of before and after restoration. The conversion will now enable this telephone to be used on a standard modern B.T line. All is now complete and in good and working order. 13" tall and 5.25" diam base. 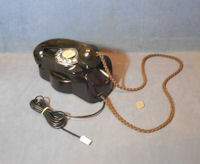 Other converted telephones are usually available. 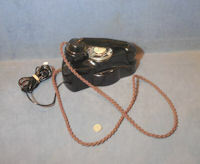 Original, quality Candlestick Telephone, with a bakelite mouthpiece and cover to the earphone. 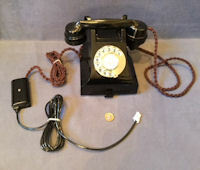 The dial version of the candlestick telephone was introduced in the early 1920's and were phased out in the late 1930's. 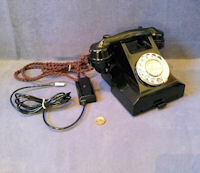 During the current restoration and conversion this telephone has been completely disassembled and cleaned, some parts and the cords have been renewed, and full details of the work carried out, with a list of replacement parts fitted is included with this item, as well as photos of before and after restoration. The conversion will now enable this telephone to be used on a standard modern B.T line. All is now complete and in good and working order. 13" tall and 5.25" diam base. Other converted telephones are usually available. 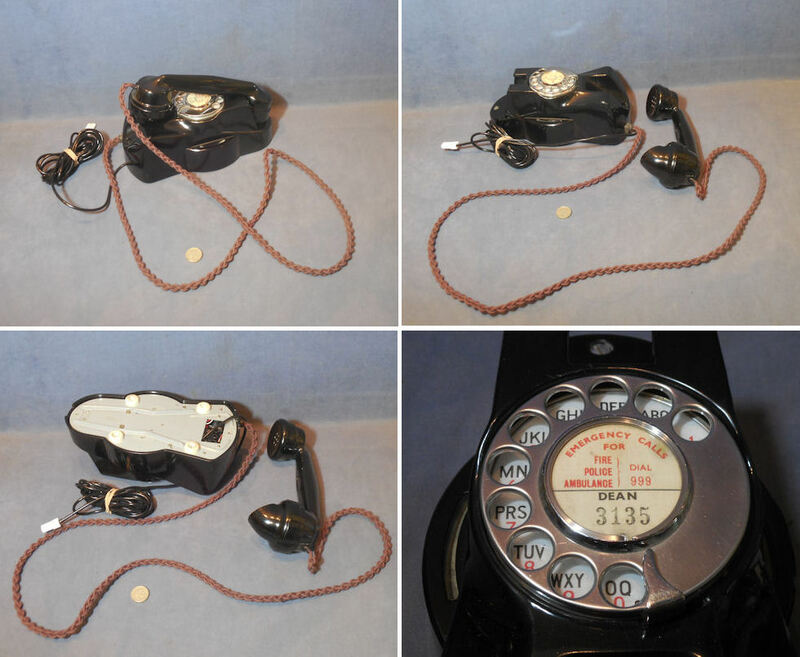 Original, quality series 300 black bakelite GPO Telephone, fully restored and converted to work perfectly on a standard modern B.T. Telephone line. The series 300 was introduced in the late 1930's and phased out in the late 1950's. 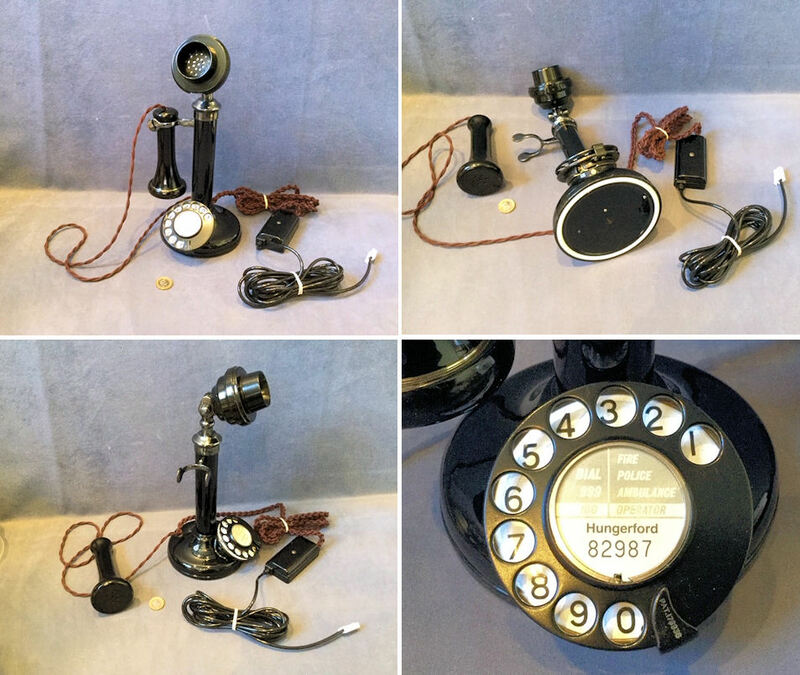 During the current restoration and conversion this telephone has been completely disassembled and cleaned and some parts and the cords have been renewed. All is now complete and in good and working order. 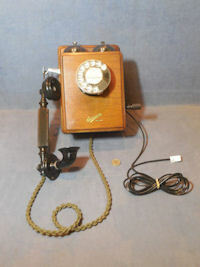 More similar converted telephones and other models are usually available. 9" wide x 6" tall and 8" front to back. 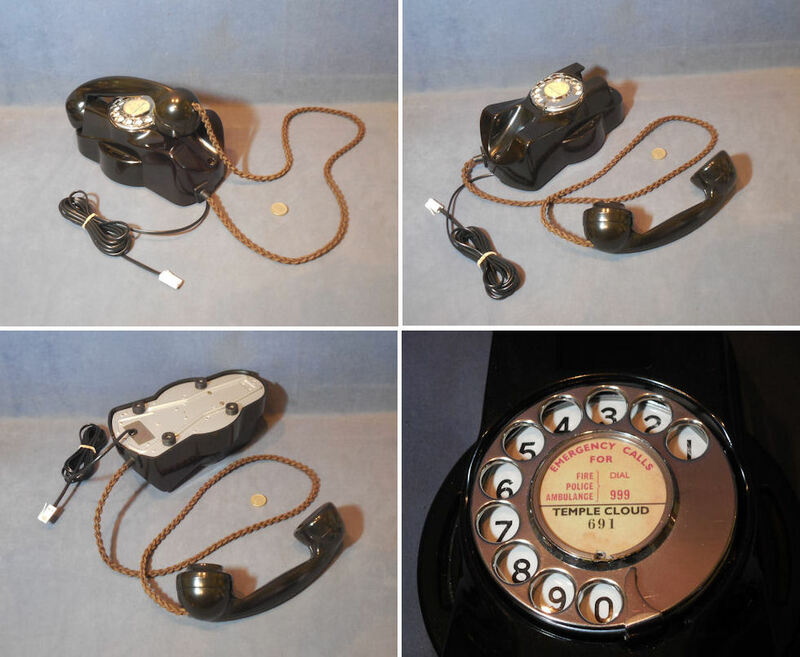 Original, quality, series 300 black bakelite GPO Telephone, fully restored and converted to work perfectly on a standard modern B.T. telephone line. The series 300 was introduced in the late 1930's and was phased out in the late 1950's. 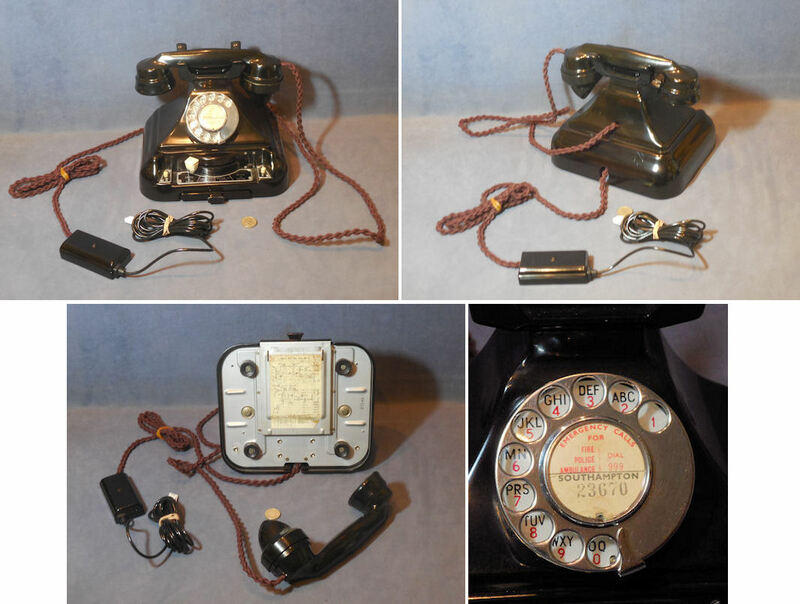 During the current restoration and conversion this telephone has been completely disassembled and cleaned, some parts and the cords have been renewed and full details of the work carried out with a list of replacement parts fitted is included with this item, as well as photos of before and after restoration. All is now complete and in good and working order. 9" wide x 6" tall and 8" front to back. 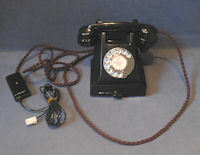 More similar converted telephones and other models are usually available. 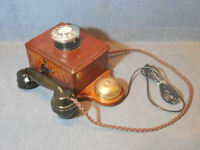 Original, quality wall telephone produced by Gent of Leicester and introduced around the 1920's as a railway telephone. The primary function was to be an intercom between stations and generally situated in the signal box. This example has been fully restored and converted to work perfectly on a standard modern B.T. telephone line. 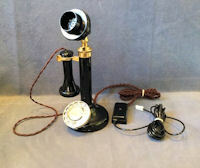 During the current restoration and conversion this telephone has been completely disassembled and cleaned, some parts and the cords have been renewed, and full details of the work carried out, with a list of replacement parts fitted is included with this item, as well as photos of before and after restoration. All is now complete and in good and working order. Backplate 11.5" x 6" and total 7" front to back. 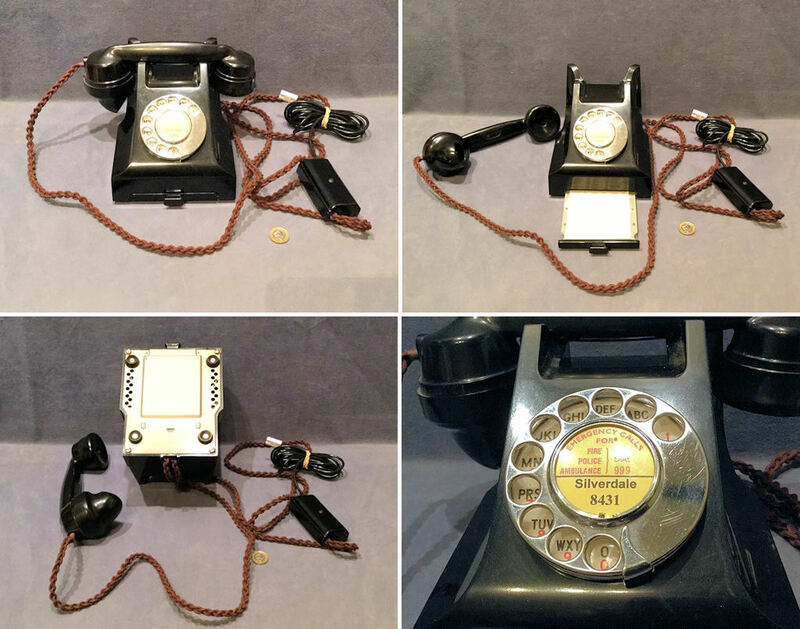 Original, quality series 200 black bakelite King Pyramid Telephone, fully,restored and converted to work perfectly on a standard modern B.T. telephone line. The series 200 was introduced in the late 1920's and phased out in the late 1930's. 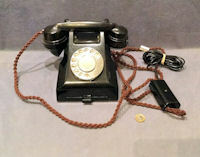 During the current restoration and conversion this telephone has been completely disassembled and cleaned, some parts and the cords have been renewed, and full details of the work carried out, with a list of replacement parts fitted is included with this item, as well as photos of before and after restoration. All is now complete and in good and working order. 8" tall and base 9" x 7.75" front to back. Original, quality bakelite Mura 'K' Wall Telephone, fully restored and converted to work perfectly on a standard modern B.T. telephone line. This model was introduced in 1956 and was superseded by the 'New Mura Phone' in 1966. 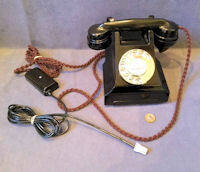 During the current restoration and conversion this telephone has been completely disassembled and cleaned, some parts and the cords have been renewed, and full details of the work carried out, with a list of replacement parts fitted is included with this item, as well as photos of before and after restoration. All is now complete and in good and working order. Other converted telephones are usually available. 9.5" long, 5" wide and 5.75" front to back. Original, quality Bakelite Mura 'K' Wall Telephone, fully restored and converted to work perfectly on a standard modern B.T. telephone line. This model was introduced in 1956 and was superseded by the 'New Mura Phone' in 1966. 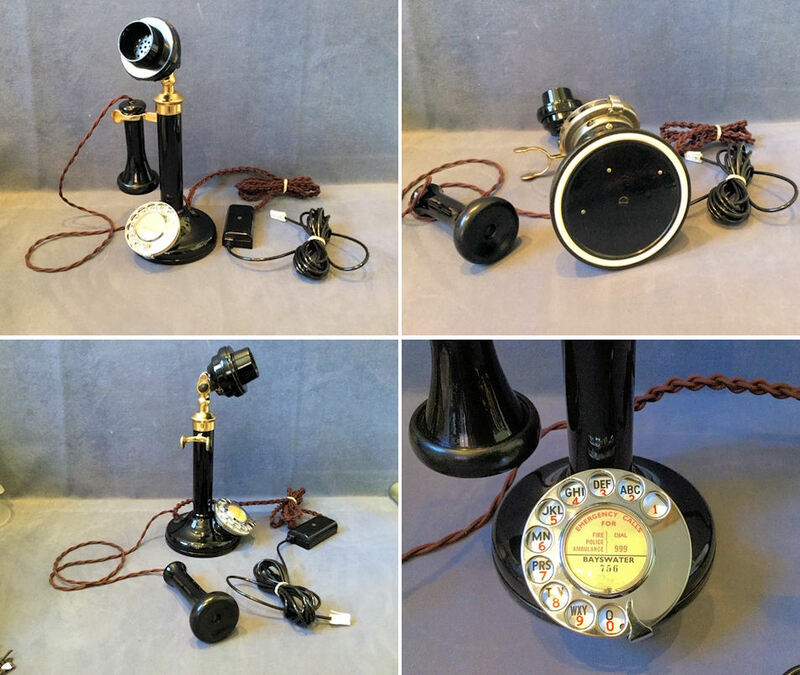 During the current restoration and conversion this telephone has been completely disassembled and cleaned, some parts and the cords have been renewed, and full details of the work carried out, with a list of replacement parts fitted is included with this item, as well as photos of before and after restoration. All is now complete and in good and working order. Other converted telephone are usually available. 9.5" long, 5" wide and 5.75" front to back. 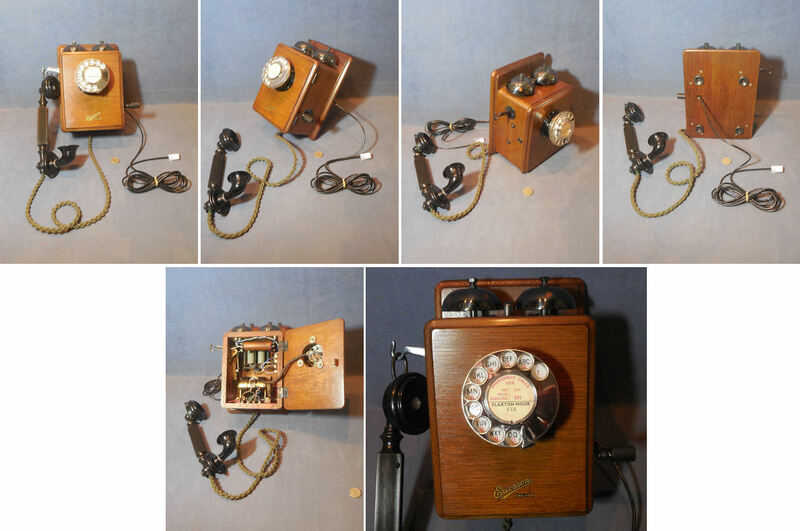 Original, quality Ericsson No2200 oak cased 'G P O' Wall Telephone, fully restored and converted to work perfectly on a standard modern B.T telephone line. The model was introduced in around 1906 and originally did not have a dial. 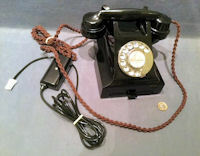 During the current restoration and conversion, this telephone has been completely disassembled and cleaned, some parts and the cords have been renewed, and an old dialling system has been fitted, and full details of the work carried out and replacement parts fitted is included as are pictures of before and after. This example has retained the original finish and transfers to the cabinet and the original bronzed finish to the bells, crank handle (now disconnected), and side hook for the telephone. 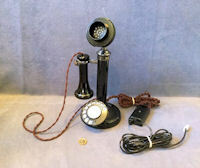 All is complete and in good and working order, and a selection of other converted telephones are usually available. Cabinet front 7.5" x 6". Backboard 9.5" x 6.75" and total 6" front to back including dial. 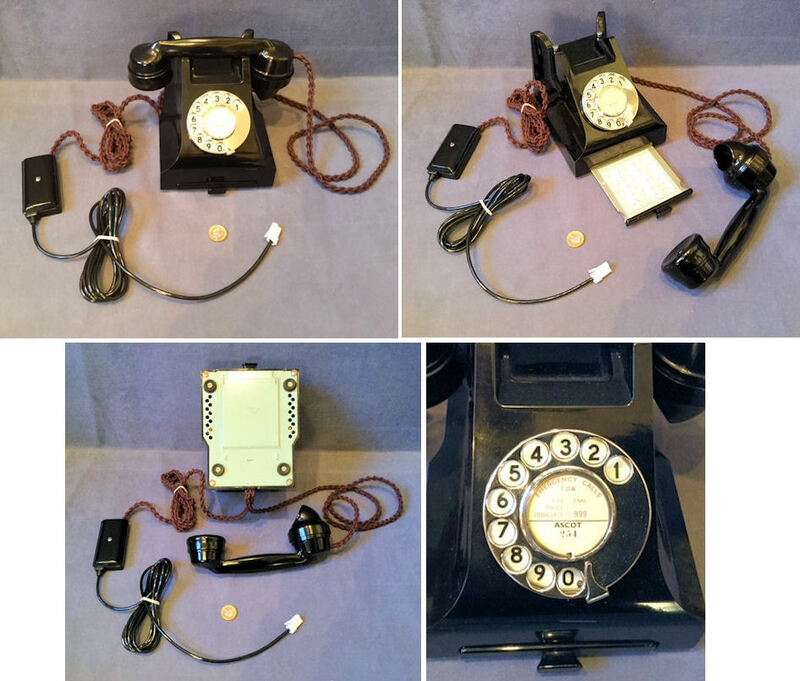 Original, quality, series 300 black Bakelite GPO telephone fully restored and converted to work perfectly on a standard modern B.T. telephone line. The series 300 was introduced in the late 1930's and was phased out in the late 1950's. 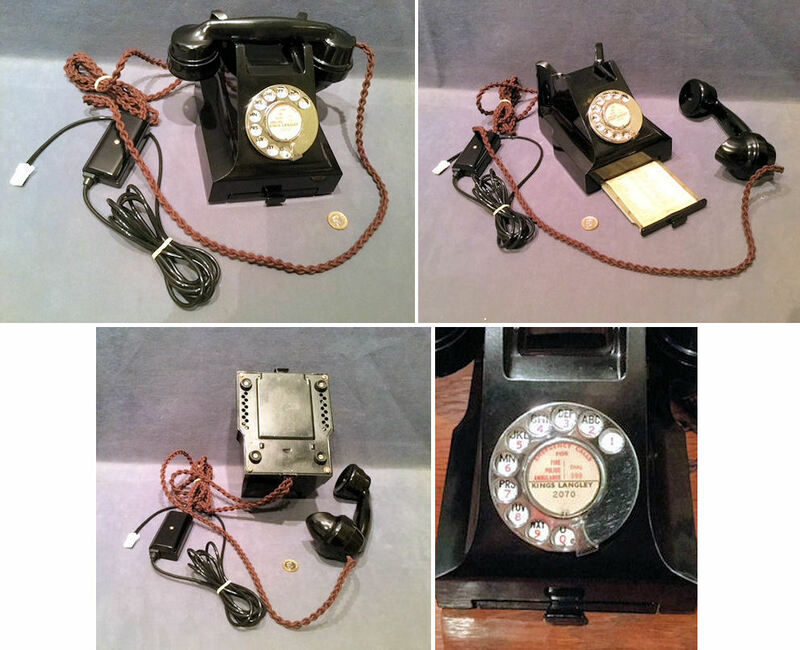 During the current restoration and conversion this telephone has been completely disassembled and cleaned, some parts and the cords have been renewed and full details of the work carried out and a list of replacement parts fitted is included with this item, as well as photos of before and after restoration. All is now complete and in good and working order. 9" wide x 6" tall and 8" front to back. 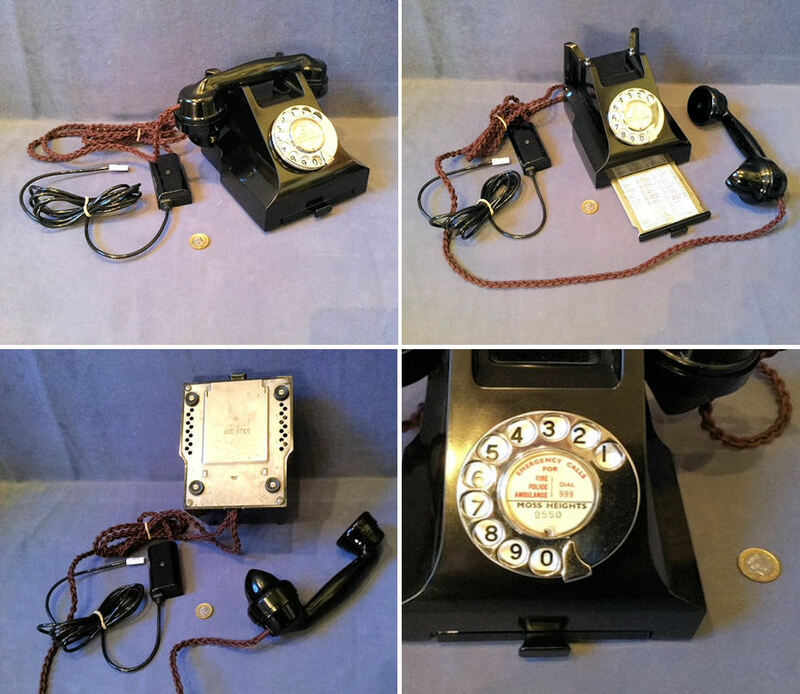 More similar converted telephones and other models are usually available. Original, quality, mid to late 19th century, two piece intercom tube mount in lignum vitae and fitted to the original brass and iron pipe mounts.The mouthpiece and whistle are in super condition and work well. These were used in smart houses and hotels etc for communicating to different floors. 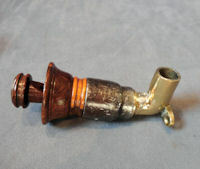 This example would have another at the other end of the pipe. Most unusual to find these in good order today. Flange 2" diameter, whistle 2.5" long, total (as in photo) 5" x 2". Original, quality 1920's / 30's rectangular shaped enamel sign, on the original galvanised wrought iron wall bracket. This very clean sign details in white upper cased text "You May Telephone From Here", to both sides. Some minor fading to the enamel in places but no chips or stains and complete and in exceptional condition. Sign 22" x 9". Backplate 28.5" x 4". Total 23" front to back.